Engross yourself in rich and balanced stereo sound with the red ENHANCE USB LED Gaming Speakers from Accessory Power. 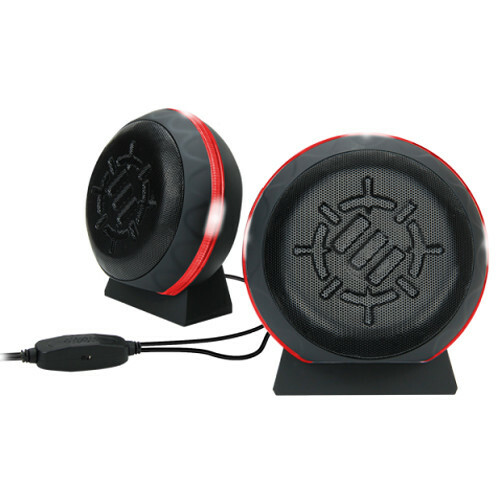 These desktop speakers feature a plug-and-play design which allows you to power the speakers via the USB connection and connect to the computer's audio jack or an MP3 player via the included 3.5mm cable. Once plugged in, the in-line volume controls make it easy to manage the volume while the LED light switch turns the speaker lights on or off. When finished, simply unplug these lightweight speakers and take them with you virtually anywhere you go. With 20 watts of peak power, the ENHANCE LED gaming computer speakers let you listen to your music and movies with rich and balanced stereo sound. Built with dual drivers and enhanced bass technology, this 2.0 channel setup provides a clear and dynamic audio experience. The ENHANCE LED stereo speakers are ideal for desk setups that are compact and limited in space. With a smart, concise build; these speakers pack a punch without the bulkiness of other speakers. Complete with a lightweight feel, the speakers make it easy for you to take them with you on the go. The sharp, glowing LED adds color to your gaming setup, office, or workstation. Use the built-in switch to turn the lights on and off. A rubberized base helps to keep the unit in place. An easy to use plug-and-play design means setting up is simple. Connect to your computer's USB port for powering and then connect the included 3.5mm cable from the computer's audio output to the speaker's input and you're ready to go. The in-line volume controls are convenient for quick adjustments when needed. Box Dimensions (LxWxH) 7.0 x 5.5 x 5.0"